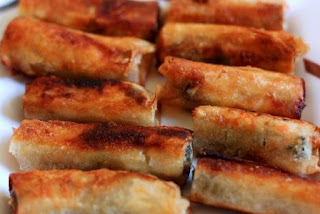 I love lumpiang shanghai --it's the Filipino version of egg rolls or spring rolls. When I didn't know how to cook yet, I favor the lumpia of Meal Stop (Telephone No. 523-1558) in Manila and Luyong's (featured in one of Connie Veneracion's Pinoycook blog entry). When we moved in to our own place, I vowed that I wouldn't buy something that I can prepare in my own kitchen. Among the recipes in my kitchen line-up is that of lumpiang shanghai. The typical lumpia consists mainly of pork, plus chopped veggies as extenders like carrots, onions---some even put singkamas (turnip). Since my husband had to watch his cholesterol levels, I see to it that we avoid pork as much as possible. I've revised most of my recipes where pork can be substituted by chicken or fish and lumpia is no exception. This recipe is the fish version, which I cook when I feel that I've had enough of chicken dishes. I used bangus (milkfish) back fillets which you can purchase in most supermarkets. For a different kick, I added raisins to this dish. Scrape off the meat of the fish from the skin. Flake the meat until it almost resembles the consistency of ground meat. Fry the bangus skin and flake it as well. Mix all (except the lumpia wrapper) the ingredients together with the bangus meat and skin. Depending on the size of your wrapper, place a tablespoon of the meat mixture at the middle of the wrapper. Roll the wrapper, wrapping the mixture inside. You can fold the sides to tuck inside the roll, sealing the ends of your lumpia roll. Fry the rolls until golden brown. You can fry the roll as a whole or cut it into smaller pieces. Serve with sweet & sour/ sweet chili sauce or ketchup. *I prefer using the wrapper bought from the wet market. Unlike the ones in the supermarket, this one is definitely cheaper---10 pesos worth (one bundle) goes a long way. Plus it's softer and it's not hard to peel off the wrappers to separate them from one another. 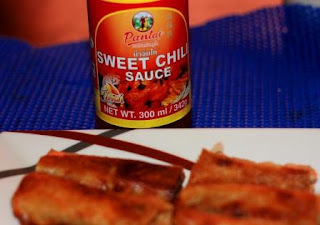 Sweet Chili Sauce, the works of wonder. Did you parboil the bangus meat before mixing with the other ingredients? @Evelyn. With the back fillet, yes I did that. But I discovered a neighbor selling bangus fillet which was flaked already so I just included it in the mix uncooked.